Wood pallets are amazingly useful things. take a look on the internet anytime, and you’ll find a host of different people, who have come up with ways of re-purposing pallets, turning them into anything from furniture to shelters. 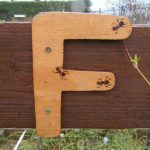 Amongst that plethora of uses, we can find a variety of different ways of using them in a garden. Wood pallets are popular for gardening because they are cheap and plentiful. Most gardeners can’t put a lot of money into their gardening efforts. If they did, gardening would be a net loss for them, rather than a net gain. While gardening isn’t exactly a profitable venture for most, those that do so, generally expect to save enough on their grocery bills to pay for it. As one who has invested a lot into a garden, I can attest to how important this is and how important it is to be able to find ways of saving money. Using wood pallets to make raised beds, planters, compost bins and for other gardening uses simply makes sense. Most wood pallets are made of oak or cedar, both woods which will not rot easily. However, they will rot eventually; so whatever you do, you need to realize that you’ll have to replace it in four or five years. Every city seems to have places that sell used pallets; but you want to try and avoid those, if possible. There are enough places where you can get free pallets, that you shouldn’t have to pay for them. The first source that you might have is deliveries to your own home or neighborhood. If you or your neighbors have construction or gardening materials delivered to your house, chances are it will be palletized. I save those. If you don’t have any, ask your neighbors. It’s not uncommon to find people who have a couple of them in the backyard, just waiting until they need them for something. Local businesses are a good source as well. While only larger stores receive materials on pallets, many small warehouses receive palletized shipments. Look around for the strip warehouses, offices with a warehouse attached behind. A quick drive behind them will generally reveal stacks of pallets just waiting for someone to need them. The first place I saw pallets used in gardening was in creating vertical gardens. A vertical garden is any sort of garden where pots are hung on a vertical surface, allowing you to get more plants into the same amount of floor space. They are very popular amongst the survival community, as well as for anyone who lives in an apartment, where they have limited space for a garden. 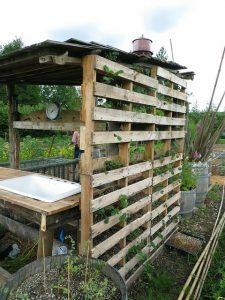 There are several ways of using pallets for vertical gardening. One of the best is to turn the pallet itself into a planter. To do this requires simple modifications to the pallet itself. Generally speaking, pallets have a top side and a bottom side. The bottom side will only have few slats, connecting the spacer blocks. This will become the back of your planter. The top side might be solid slates, but will usually have the slats separated by a space of three to four inches. These are ideal for this sort of planter. Lay the pallet bottom side up on sawhorses or a workbench. Then cover the entire back and edges with a heavy landscaping fabric, drawing it taught and stapling it to the pallet securely. Leave what will be the top end open. Cover the landscaping fabric on the bottom of the pallet with a thin layer of plywood, such as ¼” lauan. If you have scraps of plywood from another project, they can be used for this as well. With the pallet prepared, stand it up where you want the vertical garden to be located and secure it in place, either with some sort of feet or using L-brackets to attach it to a privacy fence. You want the pallet to be exactly vertical when in place. Fill the space inside the pallet with a good potting compound, that has a high peat moss content. You don’t want to use garden soil, as it won’t have enough peat moss and will fall out between the slats of the pallet. The peat moss gives the soil more structural integrity, helping to hold it in place. With the pallet filled with soil, it’s ready for adding your plants. You can put the plants in every open space where soil is showing. Pack them in well, as they will have plenty of soil to grow in. Add more soil as needed to take care of settling. The soil needs to settle and pack in, so as to give it structural integrity. Between this and the plants’ roots, it shouldn’t wash out. Something very similar to what we just discussed can be done for making a simple raised bed garden. In this case we’re going to cover the bottom of the planter with a heavy-duty landscaping fabric once again, but we don’t need to bother covering the bottom of the pallet with plywood. The ground itself is going to act as the backer for the landscaping fabric. Before making the planters, lay them out on the ground, so that you can make sure that the ground is level and flat. Irregularities in the surface may need to be cut down or filled with soil to provide a smooth surface, allowing the pallet to sit level. Staple landscaping fabric to the bottom and edges of the pallet, as before, with the exception that one end won’t be left open. If you have some scrap 1”x 4”s or slats from pallets that you’ve taken apart, you can use those to cover the open ends of the pallet, nailing them into place. It is best to use hot-dipped galvanized nails for this, so that they do not rust. Lay the pallets out, side by side, to form your garden beds. If you would like the beds higher, to make it easier on your back, you can place additional pallets underneath your planter. These could even be damaged pallets, just as long as they have enough structural integrity to provide support. If there are any slats missing, replace them with slats from a scrap pallet. Fill the pallet with garden soil or potting soil, making sure to fill the area that is hidden underneath the slats as well. Plant your seeds or seedlings in the spaces between the slats, which provide nice, neat rows for your garden. A deeper raise bed can be made out of pallets, just by splitting them. This is useful for any sort of root crops that you might want to grow. The Wood Pallet Vertical Gardening and Wood Pallet Raised Bed Planters we just discussed aren’t good for growing carrots, potatoes, onions, beets and other root crops, because the soil isn’t deep enough for them to grow to maturity. You need a deeper bed; but that can still be made out of pallets. To make these deeper raised beds, you’re going to need to cut the pallets, splitting them. This is done along the length of the slats, cutting through the spacer blocks. Depending on the construction of your pallets, you will probably only get one split out of each pallet, as there are usually only three slats on the bottom side. You’re actually going to be cutting to one side of the middle slat. So the part with the single slat will be scrap, which can be taken apart to give you extra slats. One option with those extra slats is to use them to fill in the space between slats on the part of the pallet you are going to keep. However, that is not necessary. That space can be left open, to use the sides of the raised bed planter for vertical gardening and get more productivity from your garden. Nailing four of your half pallets together to form a square nets you a four foot square raised bed. You’ll want to use matching pallets for this, as that will make it easier to make your garden bed come out square. Individual beds can be lined up side by side or left with aisles between them. It is not absolutely necessary to line the planter with landscaping fabric, but it is a good idea to put a layer of it on the ground, before filling it with soil. This provides a barrier for anything that is already in the ground, keeping it out of your garden. Many people like to cover the walkways in their raised-bed garden with wood chips, crushed rock, gravel or paving stones, providing themselves with a surface to walk on, which will not get muddy. Another option for this is splitting pallets, as we just discussed and using the pallet halves as walkways. Being raised above the ground, they will not get muddy, even when it rains. Wood pallets can also be cut up to make plant stands. For this, you’ll want to cut the pallet into roughly quarters. Think of it this way, you’re actually going to make two mini-pallets out of each full pallet. To do this, first cut the pallet to one side of the middle spacer block. Then, cut the piece which has two spacer blocks, turning it into two squares. You may need to add another slat on the bottom side to do this, but you can probably just cut through the center slat. The pallet quarters can now be attached together in a number of ways, using slats taken from other pallets to hold them in place and space them out. You may want to do a stairstep design, with several tiers or make a central column, with pallets sticking out to both sides. The mini-pallets can be used as planters themselves or used as shelves to put pots upon. There is literally no limit to the possibilities in making this sort of plant stand out of pallets, other than your imagination and creativity. Pallets are an excellent raw material for building a large variety of things, and their rustic look works well in a garden.